You know that strange viral marketing campaign popping up around the Interwebs as of late? Well, we know what it means now thanks to GM’s CEO Fritz Henderson and it’s somewhat impressive – and a tad dubious. 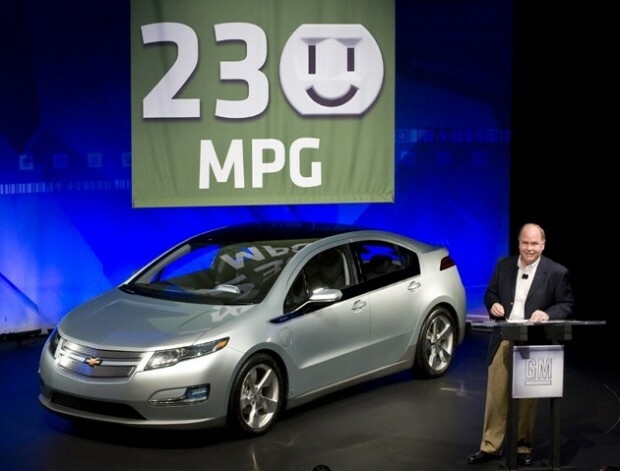 GM is claiming that under the new EPA guidelines, the Chevy Volt will hit 230 MPG. The Volt would be the first car to ever earn a triple digit number. Take a look at the current high-mileage kings and that 230 MPG rating really sinks in. The EPA handed the Prius a 51 MPG city ranking and the Insight a 41 MPG. The EPA says that the Ford Fusion hybrid can get 41 in the city and the Camary Hybrid 40 MPG in the city. With hyper-mileage tactics like killing the engine to coast down hills and fancy pedal work, a few obsessed drivers have pushed a few of these cars into triple digit territory. None of these cars of course benefit from a battery pack that can power the car exclusively for 40 miles, though. The only real competitor to the Chevy Volt is the Fisker Karma as it’s fundamentally the same powertrain design but the EPA hasn’t had a go with that EV yet. There is the Tesla Model S too, but that vehicle is limited by the range of a battery pack and doesn’t have an on-board gasoline generator like the Volt and the Karma and therefore will not be ranked under the same guidelines. The methodology behind the 230 MPG rating haven’t been released. There is no telling how the Volt’s 40 mile electric-only mode factored into this ranking. The EPA revised its formulas in order to generate a more accurate real-world representation of what EVs can achieve and the Volt’s the first car to benefit from this revision. Frank Weber, the Volt’s chief engineer and the tour guide during my Volt test drive, indicated that the 230 MPG rating is based on combined electric-only mode and charge sustaining mode with the 1.4 L electric generator running. We’re still curious about the actual mileage to be driven during the EPA’s testing and how the car will rank in highway mileage ratings. But despite my bit of skepticism, you can’t deny that GM has something special in the Volt. However it’s measured, 230 MPG is a gigantic improvement for a lot of people that can take advantage of the Volt’s 40 mile electric-only range. Now here’s hoping that the Volt makes its way into showrooms sometime in 2010 despite issues with GM securing government loans.